Earthly incarnations: Francis Bacon, High Priest on Atlantis, Samuel the Prophet , Alban, Roman Soldier, Teacher of Neoplatonists, Merlin, Roger Bacon, Christopher Columbus, Wonderman of Europe . The Count St. Germain, known as the “Wonder Man of Europe” in the 1700’s. He looked the same for 100 years, spoke every language, traveled by thought, fed the poor, and worked for peace. He took his body into light (ascended), and now works with humanity mostly from the lighter realms. Two of his well-known embodiments were Christopher Columbus and Merlin the magician, a spiritual adept who has unfortunately been mythologized. In a series of recent embodiments from the prophet Samuel to Francis Bacon, Saint Germain was the all-pervasive mind, laying the empirical foundation for an age of enlightenment, pushing back the barriers of limitation in the physical and spiritual sciences. As Roger Bacon he directed and inspired devotees of the sacred science, then in his embodiment as Saint Germain, the Wonderman of Europe, he outpictured the quintessence of the alchemists’ dream for all to see. 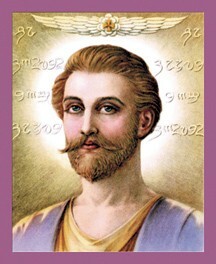 The Ascended Master Saint Germain teaches that the highest alchemy is the transformation of one’s human consciousness into the divinity of the Higher Self. He stands ready to assist all souls in this endeavor. He has also said he would release the technology of the Aquarian age when the nations shall have put behind them the destructive uses of science and religion to accept the challenge which lies at the heart of both, which is for man to enter his heart and the nucleus of the atom and to harness from both the unlimited spiritual and physical resources to establish the golden age. In the twentieth century, the Master went before the Lords of Karma to plead the cause of freedom for and on behalf of the original 576 he has sponsored, expanding that circle to include the Lightbearers of all centuries–the original Keepers of the Flame who came with Sanat Kumara as well as the children of God who had been evolving unto the spiritual gifts and graces through earth’s numerous ages. However, as the decades have passed, the rate of increase in the return of mankind’s karma has precipitated what is known as the Dark Cycle–the era of Chaos and old Night whose signs are foretold in Revelation, even as the hoof beats of the Four Horsemen can be heard throughout the land. Unfortunately, and this word is mild, but it is unfortunate indeed that the laws of Christ and his Teachings, so meticulously brought forth to the close initiates, are not fully known today, having been taken even from the holy people. Therefore, to obey Christ becomes the challenge of the hour–to find the Person of that Christ, to find the Way and the Teachings. You have received the lost Word and the lost Teachings of Jesus Christ through our effort….As a result of this, you have been strengthened and protected in that Word and Teaching. And some from among you have taken their leave at the conclusion of their embodiment and gone on in the full resurrection with Jesus Christ….Thus, the proof of the Teaching and the Path is that it leads one successively to that higher and higher consciousness where unto the individual is assumed into the very heart of the I AM Presence [becoming indeed the pure Person of that Christ]. Today, as we see the cycles of earth’s returning karma reach a mounting crescendo wherein even the four sacred freedoms are threatened, the Brotherhood has set aside a place in America’s Rocky Mountains for the pursuit of the Lost Teachings of Christ to their fullest expression. Thank u for another powerful message! !